producing large clusters of single or double flowers in almost every color except for blue. Some varieties are upright plants, growing up to 2 feet tall, but the majority of tuberous Begonias grown are multi-stemmed, pendulous hanging plants. Their flowers often resemble Camellias, Roses or Carnations. Begonias should be grown in partial sun or light shade and planted in a sandy soil mix that contains added peat moss and compost. They can be planted directly in the garden after all danger of frost has passed, or started indoors about 8 weeks before the last killing frost. In the garden, prepare the planting area to a depth of six inches, adding sand and peat moss as needed. Space the Begonia tubers 12" apart, with the hollow side UP. Cover with 1" of fine soil. Keep the soil evenly moist and feed monthly with a good all purpose fertilizer once new growth begins to show. Stop feeding in late summer and allow the plants to slowly die back during the fall. Dig up the tubers after the first frost and store them in dry peat moss in a cool, dry place until spring. If you intend to start your Begonia tubers indoors, for planting outdoors, use a planting mix of ½ peat moss and ½ sand in pots or flats. Set the tubers and cover them with ½" of soil and maintain a temperature of 70°-80° until new growth is established, then reduce temperatures to around 68° until it is time to plant them in the garden. Tuberous Begonias can also be grown as house plants, provided that their needs are met. such as an unobstructed east facing window. Allow the soil to dry slightly between waterings, then water thoroughly. Keep water off of the flowers and foliage to help avoid powdery mildew and possible crown rot. Provide additional humidity by misting tuberous Begonias daily or by setting the plants on shallow trays filled with moistened pebbles. While in bud or bloom feed your Begonia monthly with a ½ strength solution of a water soluble houseplant fertilizer (15-30-15). 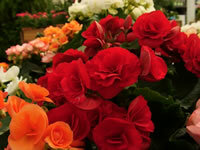 Ideal growing temperatures for Begonias grown indoors are 65° to 70° F. during the day and 50° to 65° at night. As is the case with any house plants, always avoid hot and cold drafts! 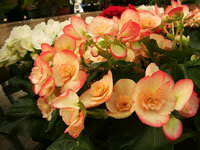 After your Begonia has flowered for several months, blooming will begin to decline. When this happens, give your plant a fresh start by cutting it back to within 3 inches of the crown. Place it in a cool location with moderate light and keep it on the dry side, but don’t allow the soil to dry completely. When new growth begins to emerge repot the plant, move back to brighter light and resume moderate watering and light fertilization. Tuberous Begonias do not like to be root bound, so you should repot to the next larger size pot. Begonia seeds need light for germination, so do not cover these tiny seeds! Tuberous Begonia seeds should be sown indoors 12-16 weeks before planting time in the garden. Maintain a temperature in the growing medium of 65°-75°.